Dana Stone (left) and Shyrea Minton lead a training workshop for CSUN student counselors. 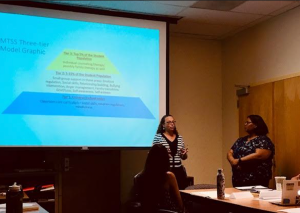 The California State University, Northridge Department of Educational Psychology and Counseling has taken on the journey to impact adolescents through offering counseling services to students and their families at four K-12 Catholic schools in the San Fernando Valley. ​​The schools include: Guardian Angel School in Pacoima, Our Lady of the Holy Rosary School in Sun Valley, St. Patrick Catholic School in North Hollywood and St. Genevieve Parish School in Panorama City. Originally, the idea for this program sprung from various private schools that expressed their need for counseling services. CSUN’s school counseling program and Mitchell Family Counseling Clinic in the EPC department heard their requests and decided to fulfill them. The grant process however, would prove itself to be a challenge. Joyce Medley, director of Mitchell Family Counseling Clinic – a community service site for the Department of Educational Psychology and Counseling in the Michael D. Eisner College of Education at CSUN – started building relationships for the grant process in 2015. In June 2018, a three-person grant team along with Medley were awarded $301,000 for an 18-month program by The Counseling Services for Catholic Schools Collaborative grant, funded by the Well Being Trust, national foundation dedicated to advancing the mental, social and spiritual health of the nation. “Emotional pressures on many of these students are immense,” said Shyrea Minton, an associate professor of Educational Psychology and Counseling. “Many are — or fear being — separated from family members due to immigration status. Others experience life-changing family dynamics as a result of trying to survive economically, and many of their parents are undergoing separation or divorce proceedings. The grant is coordinated at CSUN by a four-person team: adjunct professor of ​Educational Psychology and Counseling, Deborah Buttitta; Medley; and associate professors Minton and Dana Stone. The CSUN grant-funded Counseling Services for the Catholic School Collaborative will provide school wide preventative interventions and counseling services to an estimated 2,000 students across the four schools. All students will be eligible to receive counseling services for themselves and their families. Many of the students attending the target schools are low-income from first generation families from Mexico and Central America. Each school will have a plethora of counseling services for themselves or their parents or guardians. The counselors will be CSUN Educational Psychology and Counseling graduate students who will receive class credit for participating and field work experience. The program began in September and will run for 18 months. Future plans for the program are to maintain funding after the grant to make the services permanent and expand their reach.